Our Lady of Czestochowa arrived around 4pm at Sts. Peter and Paul on the Westside in Detroit, MI. A mass divine mercy chaplet and time for confession were part of today's schedule beginning at 5pm. 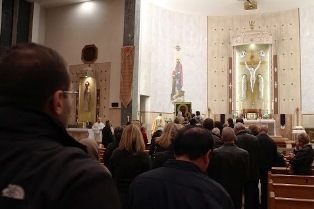 Eucharistic Adoration preceded the 7pm mass and continued after it for an all night vigil. The city of Detroit is generally divided into East and West side. There is also a racial divide at 8 mile road in the city of Detroit. We pray that there is healing along with the end of abortion and that all can recognize each other as created with equal dignity. In our prolife work we often see minorities targeted for abortion. Evening mass in the Sts. Peter and Paul was celebrated along with hymns in English and Polish. Also after mass we recited a rosary that ended with the litany to the Blessed Virgin Mary chanted beautifully in Polish accompanied by violin. There was a long line to venerate the Black Madonna. There is so much devotion to see the icon all express their appreciation and manifest much love for the Black Madonna. No one ever complains that the line is too long to see her. In addition to seeing the Black Madonna many signed up to follow the icon and receive updates and news from HLI. Afterwards we had dinner with Fr. Jerry, Pat, and Walter. Included as part of dinner Fr. Jerry (Fr. Jarosław Pluś) served homemade bread that he made which was exceptionally good. There was great companionship. The word itself comes from the combination of two words - con pane (with bread) which is typically shared between friends.